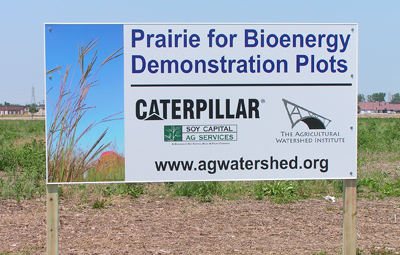 Caterpillar, Inc. (CAT) and the Agricultural Watershed Institute (AWI) are conducting a multi-year joint project to demonstrate production of perennial prairie grasses and forbs for bioenergy on property owned by CAT in Decatur, Illinois. The property is bounded on the south by Pershing Road, on the west by 22nd Street, and on the east by 27th Street. Hubbard Avenue crosses the property near the north edge, dividing the parcel into two sections. CAT is interested in planting native prairie species and considering use of biomass for renewable energy as appropriate, in keeping with the company’s sustainability strategy. AWI is conducting a Local Bioenergy Initiative that focuses on planting perennial energy grasses for both renewable energy and conservation benefits, including wildlife habitat, soil conservation, water quality protection, and greenhouse gas reduction. One of the goals of the Sustainable Decatur plan recently adopted by the Decatur City Council is to “promote the production of perennial bioenergy crops in order to improve water quality, provide a renewable energy resource, and create economic development opportunities.” The plan calls for creating markets to make production of energy grasses economically feasible with a target of 10,000 acres by the year 2020. 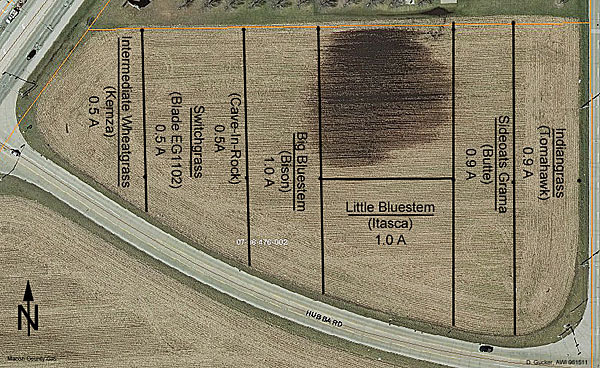 The CAT – AWI Prairie for Bioenergy project will help to advance the objectives of CAT, AWI, and the City of Decatur by providing approximately 61 acres of harvestable biomass and demonstrating management practices for field-scale production of native prairie plants as an energy crop. Another use for biomass is forage, feed for ruminants. Forage provides energy and nutrients for livestock, while at the same time protecting the land and the water that drains from it. A forage crop covers the land all year long. This keeps the soil from eroding and prevents nutrients in the soil from leaching into surrounding surface waters. The following picture shows Dave Brix, a local farmer, mowing the Blade EG1102 switchgrass plot. This grass will be preserved by letting it dry and it will then be baled and fed to his cattle as hay. Switchgrass makes an excellent hay, when it is cut at the proper time. 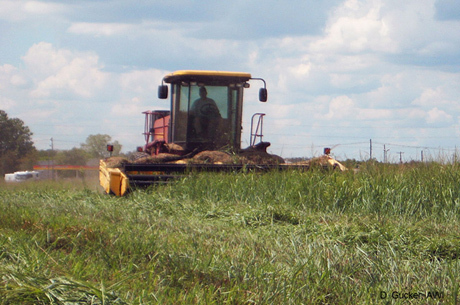 Local farmer mowing switchgrass, a biomass crop that can be fed as hay.